KINESIOLOGY TAPING was invented in Japan in the 1970s. To-day Kinesiology tapes are used by chiropractors, physios, medical practitioners and athletes in Japan, the United States, Europe, South America, Australia, and Asia. The method of Kinesiology taping relies just as much on the technique of its application as it does on the properties of the tape itself. You can’t use any old tape! 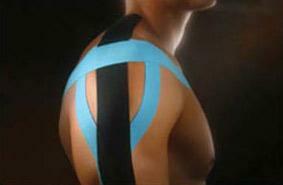 Kinesiology tape comes in different colours, depending on what effect is needed for each individual. The tape is not rigid like strapping tape; it’s flexible, comfortable and functional, allowing and encouraging full range of movement. It can be used up to five days without changing, is water resistant and can expand up to about 40 percent of its actual size! The wave pattern found on the tape’s adhesive has a lifting effect on the skin which can reduce swelling and inflammation by improving circulation and reduce pain by taking pressure off pain receptor. The therapist uses the tape over and around muscles in order to assist and give support or to prevent over-contraction. It is applied with a stretch to the tape or to the target area in order to create space under the skin and create the desired effect on the musculature. This affect causes changes in deeper layers of fascia by manipulating the skin and muscle, creating space underneath the skin to improve circulation and lymphatic drainage. The popularity of elastic therapeutic tape in the United States surged after 50,000 rolls were donated and the tape was seen on Olympic athletes in the 2008 Beijing Summer Games. Of these athletes, the most notable was Kerri Walsh who used the tape in competition following surgery on her rotator cuff. Serena Williams has also used therapeutic tapes during competition. Lance Armstrong, 7-time winner of the Tour de France, talks about using tape in his book, where he describes the effectiveness of the treatment for his sore muscles. David Beckham was seen clearly using Kinesiology tape on his ribcage during matches. Kinesiology Taping is greatly effective in therapy since it has the ability to relax overused and overextended muscles, as well as rehabilitating muscular injuries. It can also be used to reduce the inflammation or the swelling by not blocking or hindering circulation, hence reducing pain. By utilising a number of corrective techniques, the Therapist can promote correct muscle and joint function, as well as pain relief by targeting the pain and the source of the pain. Applications of the tape involve utilising single “I” strips or modifications in the shape of an “X,” “Y” or other specialized shapes. A study of the effect of Kinesiology Taping on changes in the tone of the vastus medialis muscle during isometric contractions found an increase in muscle tone 24 hours after application. Everyone (not just sports people)! Kinesiology tape is hypoallergenic, latex free and the adhesive compound is designed for sensitive skin. The tape works well on all ages from children to the elderly. Whether the injury is related to sport, work or poor posture Kinesiology Tape is an ideal treatment option to get you client back to exercise, training, sport and general day-to-day activities faster and more effectively. Application of the tape comes with a full assessment of your posture and biomechanics to find the source of the problem, then applying the tape for instant effect and incorporating specific exercises for maximum rehabilitation results.